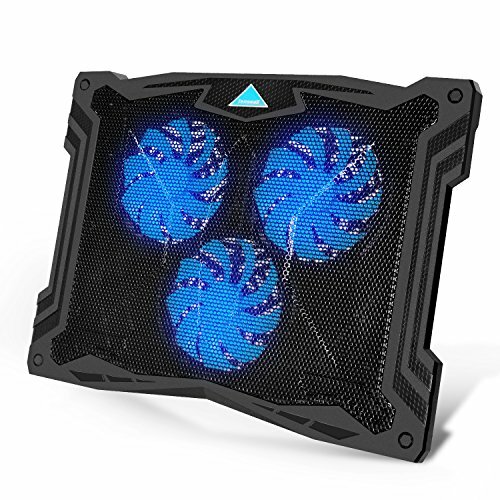 The high-quality multi-directional metal mesh of Tenswall 14"-17" laptop cooler provides your laptop with a wear-resisting and stable laptop carrying surface. Three large 110mm fans provide superior airflow at whisper quiet noise levels, spinning at just over 1200 RPM. Make you to work all day without making any noise and interrupting your flow. Need extra USB ports while using Tenswall 14"-17" laptop cooler. Just plug it into one of the two USB ports on the laptop cooler. All Tenswall Laptop are built to the highest quality standards and we stand behind our products with a full 1 year manufacturer's warranty. Optimized for Laptop Carrying: The high-quality multi-directional metal mesh provides your laptop with a wear-resisting and stable laptop carrying surface. Ultra-Quiet Fans: 3 x quiet cooling fans with 1200RPM and red LED Lights help circulate excess heat dissipation from your laptop. If you have any questions about this product by Tenswall, contact us by completing and submitting the form below. If you are looking for a specif part number, please include it with your message.